With the glorious Vermont Summer weather we have been having, everyone seems to be out and about enjoying both their residential landscapes and our natural surroundings. At our weekly safety meeting one of the crew members mentioned that everyone needed to be careful of Wild Parsnip while they are installing and maintaining our landscapes. If you are unaware of this plant then please check out our previous blog on the topic! Along with that nasty plant there is an equally awful plant that seems to be much less known and I wanted to draw some attention to it for your safety. Heracleum mantegazzianum or Giant Hogweed, is a perennial plant that can often be found along roadsides, riverbanks and along wood lines. It can reach heights of 15-20 feet tall. This plant looks like a ginormous Queen Anne’s Lace with a flower that can measure 2-2.5’ in diameter. The large stock is often mottled with purple. The stalk and the extremely large leaves are also covered in bristles. For more images of this plant check out the Invasive Plant Atlas of New England or The Vermont Gardener Blog. Giant Hogweed was brought to the United States in 1917 as an ornamental garden plant for it’s curious height, it was planted to provide interest in perennial gardens. It eventually became invasive and is now on the federal noxious weed list. 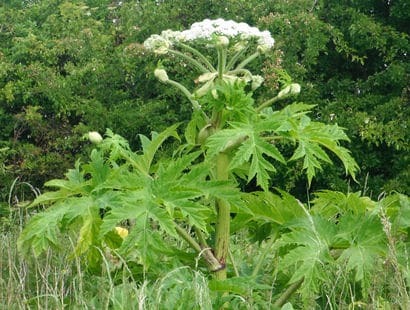 Why should you pay attention to Giant Hogweed? 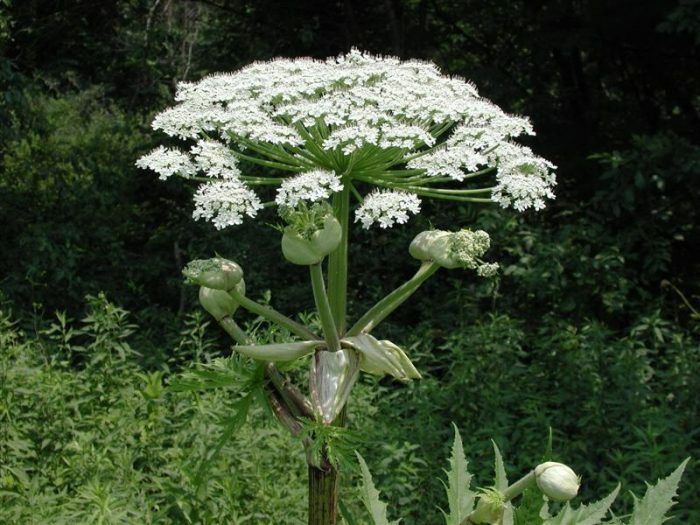 Much like it’s evil cousin Wild Parsnip, the sap of the Giant Hogweed will react with sunlight and cause serious burns to your skin, with blisters and swelling. If the sap of this plant comes into contact with your skin wash immediately. And if you don’t catch it in time and burning occurs seek medical assistance immediately. The images of these burns were literally making me so queezy I just couldn’t include one here….so please be careful if you come into contact with this plant! 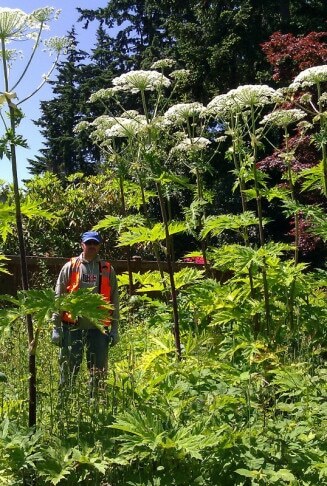 For information on removing Giant Hogweed from your landscape visit the Natural Resources Conservation Services.